Kirstin is a painter living in Providence, Rhode Island and working in Pawtucket, Rhode Island. 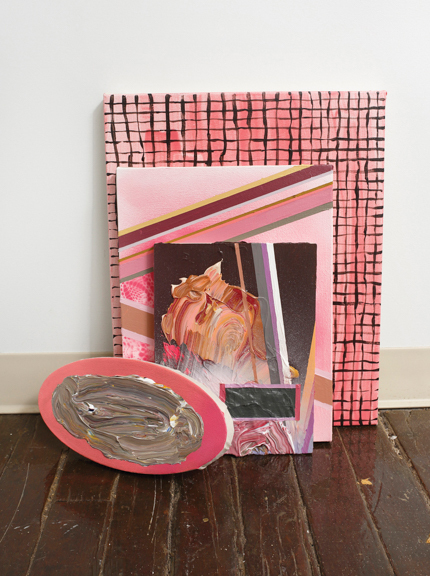 Kirstin became obsessed with classical still life and notions of stacking and heaping during her final year of graduate study in Painting at the Rhode Island School of Design in 2005. She began her studies as a literature student at Brown University, graduating in 2001 with Bachelors degrees in both Literatures in English and Visual Art. Kirstin’s work has been shown in venues across the country, notably the Ann Street Gallery in Newburgh, NY, Salvatore Ferragamo Gallery in New York, the Kniznick Gallery at Brandeis University, The Watermill Center Benefit in Watermill, NY, Silas Marder Gallery in Bridgehampton, NY, the Bromfield Gallery in Boston, the Art Gallery of Calgary in Canada, Kate Singleton’s online project Buy Some Damn Art, Darger HQ of Lincoln, Nebraska, Room 83 Spring in Watertown, MA, The Chazan Gallery in Providence, RI and Bunker Projects in Pittsburgh, PA. Kirstin's work is currently represented by Darger HQ gallery and she also has prints available with both Little Paper Planes and Company. The studio is full of props. I collect skulls, taxidermy, ribbons, fabric, vintage photographs and paper ephemera. I organize these objects and stage compositions. I create abstract pictures and portraits, large and small, to add to the still life objects staged in space. My recent work features both acrylic prop-paintings and miniature gouache paintings informed by the arrangements of these props. The miniature gouache paintings depict pictures of pictures or salon images. These pictures are derived from a fascination with Vanitas still life, cabinets of curiosity, and paintings of paintings ranging from Matisse's Red Studio to David Teniers' depictions of the collection of Archduke Leopold of Austria. I am interested in how paintings retain their relevance by taking on ideas of death of painting or a kind of comedic curation-as-painting. I tend to consider these both depictions of past set ups and future proposals for props not yet made. Over the past two years I have dedicated myself to a series of arrangements of paintings in space. I lean pictures on top of one another, hide one patterned canvas beneath another laden with similarly heavy pattern, or I stack pictures on top of painted rugs. I have made hide rugs and begun to make wall treatments, all hand painted. In addition to rugs and patterned works I include portraits, floral flights of fancy, images reminiscent of sweaters, color wheels, or Pennsylvania Dutch Hex Signs. I am particularly interested in imagery that signals a kind of American kitsch. There is a demented devotion to hand painting every last detail. In my most recent installation, The Pattern Room, the hand-painted props have overtaken a wall in pattern and sweetness. Each gridded canvas is meant to evoke a sweater pattern or embroidery. I reintroduce the traditionally feminine lap-crafted originals as less diminutive cherished objects and more a billboard for the feeling of a handmade and intimate craft, here restaged in paint. The girlish whimsy of pinks and saccharine decorative marks gives way to sardonic text and lonely pinups and portraits. I want to both overwhelm and overfeed with sweetness and also quietly chastise that impulse and its attendant guilt. I’m hoping for a kind of stifling, claustrophobic saccharine space, intimating that maturing into my gendered role was not all I’d hoped for or all I was promised. Hi Kirstin! Congrats on your recent inclusion in the New American Paintings Northeast Issue 122! Thank you so much! I was thrilled to be included as I know it is always a very competitive publication. I was especially thrilled to be in Issue 122 as a few much-admired painter friends and a remarkable former student were included in the issue with me. I can’t say how much it means to be curated into an issue with them, especially. Can you give us some insight into your process? How do you begin and how do you create your compositions? Does drawing play a part in your work? I have lately begun to think of the studio as a discrete manner of thinking about the world. For me, imaging the studio or salon is a way into narrative, but also a way to ask questions of painting. I arrived at the current work I am making through an interest in the continued rearrangement of my studio and domestic space. I consider both the paintings and installation works to be still life, but still life in an interior space. Sometimes it is merely the objects arrayed that implies the space, other times I image a floor or rug, just enough to suggest that the picture plane can also be room. So this work begins with the space I create for myself to work in. I collect a range of paper ephemera, still life objects that tend toward the cliché, color charts, tools and display objects. I re-arrange these objects into compositions on and off the wall and use them to inform the installation and painting process. I tend to gather particular phyla of objects like taxidermy, patterned fabric, penny arcade cards depicting lesser known starlets, or vintage pottery and vessels. I have a particular affinity for objects like green Depression glass or instructional plastic skulls and these objects recur throughout my work. While I stage many compositions in my studio space, I tend to draw impossible spaces or awkward mash-ups into my gouache miniatures. I like the idea of the two dimensional space as a space where gravity can fail ever so slightly, where things can be badly drawn and not hold up, where the space can be a cartoon of what is truly around me. I spend much of my time drawing and re-drawing compositions on panels with watercolor paper mounted on them. Frequently, working out the composition is the longest part of the process, as I want to surprise myself and make new connections between the various parts of the painting. I find that the re-imaging process, drawing and painting from masterworks I admire, to be an engaging process of filtering down to what it is I specifically enjoyed about each image in the first place. I also frequently re-image my own work in miniature, and find the distillation of larger works to a few choice marks to be particularly engaging. I like when things look awkwardly composed or ham-fistedly painted but have passages of clear and elegant moments as well. Much of my work is composed of observational drawing and copy work that I then re-use repeatedly in different compositions, to different effect. I combine these re-used drawings with fresh mark making that is from both observed still lives and imaginative sources, allowing for some images to be derivations or copies of earlier works whilst others may be ham-fisted quick sketches or meandering patterns. I am still trying to figure out how this process exists in my installation work, but I believe that the current installations exist as an outgrowth of my two dimensional compositional approach. 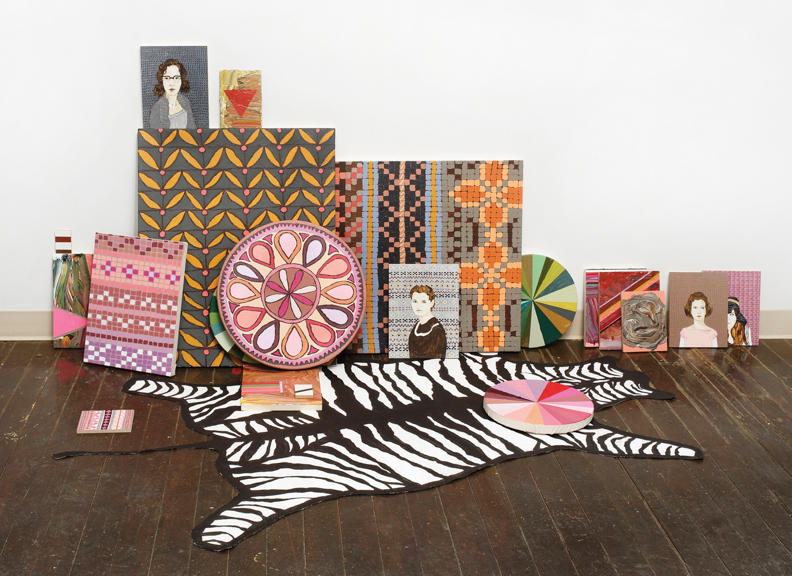 What was the inspiration to begin stacking paintings on the floor in your installations? I was making still life set ups to inform the miniature gouache paintings I was doing, and I started making my own abstract and figurative paintings “for” the still life set-ups as a lark, to be leaned and hung alongside objects I had collected like ceramics and plastic fruit. I guess I felt that I needed different planar objects around the busts, skulls, flowers, and the like. So these paintings would recur in various miniatures as I continued to re-arrange and re-stage different compositions. At the moment I was making these more elaborate still life set ups I had just finished working in a temporary position in Visual Design at Macy’s, where I got to touch and re-arrange display objects. I found much inspiration in the low-depth compositional layout of the display window and plinth. As I continued, it occurred to me that the set ups I was staging were as much the work as the paintings. I find myself deeply invested in décor and a kind of provisional preparation for the display or salon (leaning). For me, sometimes rearranging furniture is a way of thinking and inhabiting a space, as well as revising it. I made rugs because I desired them, because my rugs somehow didn’t measure up to the catalogue or display ideal. I found myself doing so in this deeply informal way, though, where I would make a zebra rug, but it would be on this curling sweetly awkward canvas or I would gather together a bunch of related paintings but instead of installing them, they would be layered on top of one another on the floor, forever waiting to be installed. I find this kind of revision to be getting me closer to my interest in a kind of feminist critique of my own role in the domestic or sales space. But this critique is really coupled with a sincere love of objects, display and the handmade, so it may come through as a kind of enthusiastic snark, which I love. 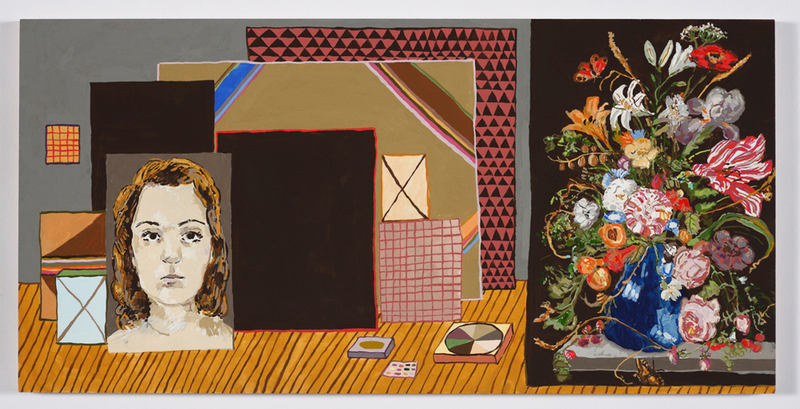 Can you talk about how individual paintings become ‘props’ in the larger installation? I think that calling certain paintings props really relates back to my need to create paintings for still life. I think that I use the word prop loosely, as I would like it to suggest display object, castoff, theatrical prop, or just the thing that holds up the thing on top. In thinking of art objects as props, I am also interested in the leaning of these props as a contemporary approach, that it suggests both precariousness and the provisional. That these things are placed just so, as in a window display, but also sometimes carelessly stacked is hopefully a tension in the installations. The props are a way for me to distance myself from the aura of the painting while comically playing on its power. What is the relationship between the painted rugs and the stretched works on canvas? I have been imaging spaces in my paintings that frequently feel to me like interiors. So it seemed an outgrowth of the interior on the picture plane, to have the picture staged with domestic objects to imply a room. But I do feel that I am also creating a space for my paintings, by staging them with rugs. I want to manipulate the space around the picture plane, as well as in it, to make a larger paint-space. I should also mention that there is a long history of painted rugs in New England, frequently on a kind of rough canvas or muslin. I consider my rugs to be a kind of modern comic version of this practice. I am a big fan of your Vanitas series as well. How did that series come about? Are your installations and Vanitas paintings related? Gosh, you ask all sorts of good questions. So I consider the new work to be an outgrowth of my work with Vanitas paintings, everything I make still feels like still life. I fell in love with Dutch Vanitas still life painting during my graduate studies and found myself copying a wide array of still life to better understand why. I was pointed to still life because of my indexical drawings of food from memory, a drawn vocabulary I was using to fuel the work at the time. I found Vanitas to be particularly useful, as it is a kind of still life that implies decay and decline within its beauty. I was trying to advance political and feminist critique using food objects and piles, and my mentors quickly pointed me to the sumptuous still life (Pronk) and Vanitas still life as a place to explore how objects (and food) can be used to advance a critique of consumption and power. I am forever grateful for the suggestion that I bury myself in still life. In painting Vanitas, I also found a vehicle for discussing the death of painting and death in painting. I frame death of painting as a life-affirming project – I approach the studio as raising the dead. I am interested in why painting persists to be valuable, even beyond arguments for the hand-made. Many of my paintings take a very concrete approach to death of painting, using literal images of death in painting. I am interested in breaking down complex ideas and arguments using concrete visual combinations, usually heaped together or made into my version of a pastiche / the salon / pictures of pictures. What is your relationship with color? How do you create color palettes in your work? Palette for me is derived from where I am working and what I am inspired to draw from. So sometimes the palette is informed by Dutch masterworks, other times it is informed by what is outside my studio window. For example, the palette of an installation I am currently working on was inspired by the colors and patterns of a chapel I saw outside of my studio window at the Wassaic Project Artist Residency in January. The slate roof had these sun-bleached tiles in reds and pinks adjacent to worn grays. The palette matched the rough-hewn and paint-splattered boards of the mill in which I was working and staging the composition. Also, I should say that I frequently lean on pink, as it is a gendered color with a contemporary punch. Pink is awkward once you are no longer a pre-teen with barrettes in her hair, but it is frequently used to sell and stage objects of desire as a kind of look-at-me color. Additionally, I cite my use of pink as being related to my admiration for Portia Munson’s Pink Project, a work that uses the still life pile or array to great affect, critiquing the use of pink in everyday products geared toward women and girls. You use a lot of different and amazing patterns in all of your work. Why about pattern interests you the most? Pattern to me frequently implies the hand-made, the lap-crafted, the domestic. I look at these objects as billboard size bootlegs of the domestic object. I use pattern to stage the larger compositions, but find that lately, the work has just been about the pattern itself. I have a deep love of Pattern and Decoration painters, and cite Miriam Schapiro, Joyce Kozloff and their ilk as crucial to my understanding of what a painting can be after modernism and minimalism. Do you look at any particular source material or resources for patterns? Pennsylvania Dutch Hex signs lately, but earlier I was looking at everything from Ani Albers to the Unicorn tapestries. I spend a lot of time with Owen Jones’s Grammar of Ornament, with a particular attention to Egyptian and Victorian patterns. I like to draw in the morning with coffee and do paperwork and writing. I usually head to the studio in the afternoon. Studio time could be me just re-arranging things for the day. I can’t predict exactly what I’ll work on, as I keep stores of things to be finished and revised, but I do like to leave something undone to be finished when I next come in. I do like the ideal of the workaday artist punching a time clock in her studio, but for me, sometimes I make work at home, in my domestic space as it inspires me too. I rearrange the food from my fridge and photograph it. I take inventory of the linens and draw from them. What are some of the biggest challenges that you have overcome as an artist so far in your career? I am a relatively shy person by nature, and find that the social and public speaking roles of the artist were a huge surprise to me as a young artist. I feel like I am continually challenging my introversion in order to show, to meet other artists, to teach. And this is a good thing. I need white walls and a table. I bring everything else with me. So all the ephemera and taxidermy and wall hangings travel from studio to studio, residency to residency. I like that making the place or situation of the studio is so intimately involved in the production of my work. I love vanilla lattes, in fact I have a problem. Also, all kinds of caffeinated tea. Geez. And frequently some sort of sugar, usually in a good color. I listen to books on tape and music with equal frequency. Lately the books on tape I am listening to are mysteries and thrillers, as I feel this pull toward a particular kind of narrative. It hasn’t shown up yet, but I feel a strong interest in a kind of murder mystery painting. I was a lit major who absolutely loved loved loved Wuthering Heights. I am an incurable romantic, but I say that with a deep appreciation for the structure and complexity of well-fabricated romantic novels. My favorite film is Defending Your Life, as I really do hope that we get the opportunity to argue for our choices in a rational, dispassionate way. I am also married to a lawyer, so maybe that idea of analyzing your life choices in a courtroom after death makes some sense. I am currently reading Tana French’s The Secret Place, a murder mystery set in a prep school. Lately I have been looking a lot at Rachel Ruysch and Haim Steinbach. But I have so many artists I love, it is hard to choose what artists I’m in dialogue with or find to be my favorites at any particular moment. Persistence. For me the only constant is continuing to make work in whatever way I can, trying to structure my life so I can continue to make and think about the work. I would also say that early on in your career it is good to say yes to as many opportunities you are offered. You may kick yourself later if you step away from something great. But most importantly, continue to nurture your relationships with the other artists you know. I find that the friendships I have with artists continue to be deeply valuable to me and inform my work and practice in more ways than I can name. It seems like you keep up a pretty rigorous exhibition schedule! Do you have any advice for emerging artists who would like to get more involved with galleries and museums and connect with exhibition opportunities? You are too sweet. I would just be persistent and keep making the work and approaching or applying for opportunities. As an artist, what is your relationship with social media? Do you have a favorite or least-favorite platform? I started using Instagram recently and find it to be the most fluid and easy to use. I just enjoy the image/text relationship not being so overwrought. Yes! I’m so happy to share that I have a show coming up this April at my gallery Darger HQ in Omaha, Nebraska. I’m paired with a Nebraska artist I really admire, Anthony Hawley, and I’m excited to see how our work interacts in the space. For details on the show please visit the website. Also, a dear friend of mine, Elizabeth Michelman, just interviewed me for this incredibly generous piece in ArtScope Magazine, a New England Art journal distributed for free to arts organizations throughout the area it covers. If you are in New England do pick one up but if you aren’t you can see an excerpt of Liz’s article here. Thank you! It is such a delight to be featured in MAAKE! To find our more about Kirstin and her work, check out her website.